At D Cross Barn Co. we fully understand the importance of having a safe, sturdy barn for your horses. If you enjoy barns that are appealing and stylish, give us a call. 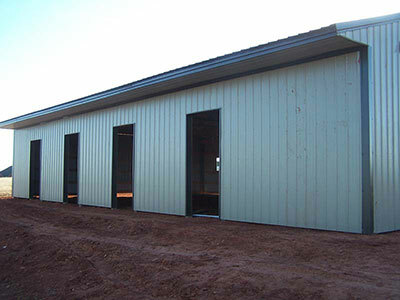 Many Tulsa and Oklahoma horse owners choose us for their horse barn construction needs. When imagining a horse barn, safety should be the first thing that comes to mind. This is the highest priority and one we don’t take lightly. However, we also understand that many owners would prefer a more stylish barn to a plain, traditional barn. Whether that is their preferred taste or they want it to complement other buildings, we’ve taken care of them. D Cross Barn Co. has a variety of options and features for our horse barns that provide the peace-of-mind you deserve. Working with D Cross Barn Co. will be an experience unlike any other. The details of every post frame building we construct are highly important because we aim to satisfy our customers. From the very first consultation, you can be confident in us because your barn is backed by a preferred, established company with one of the best reputation in the industry. If you’re concerned about your horse barn withstanding abuse from the horses or the weather, our horse barns have shown they can withstand the typical abuse that occurs to a horse’s surroundings. The layout, ventilation and overall functionality come in to play in the beginning stages of your horse barn construction, up until it is finished. It’s not easy taking care of horses but if you love horses you know it’s worth it. If you are thinking about a new building for your horses you can trust D Cross Barn Co. to help you create the ideal horse barn that is safe, sturdy, and compliments that of your existing buildings or home.